Psychosis is a change of the normal functioning of the brain. Psychosis (or psychotic episode) is when you perceive reality in a very different way from people around you. People say you ‘lose touch with reality’. This can be severe and distressing. Psychosis is a type of experience that doctors regard as a symptom. Generally psychosis is normally a symptom of some other mental health problems and not a diagnosis in itself. Sometimes psychosis is confused with schizophrenia. The term schizophrenia is normally used for psychotic states that last longer. Many young people at times can feel as if they are ‘going mad’. This is generally when they are feeling stressed, confused or upset. Worries like this are rarely a sign of a severe mental illness or psychosis. Psychoses are quite common and affect people of all ages but are rare before the older teenage years. The risk of becoming psychotic at some point in one’s life is estimated as 1 in 100. It happens in all cultures and countries and in all social classes. Men develop psychosis at a slightly younger age than women. There are around 5 to 6 teenagers experiencing psychosis in every 1000 people at any given time. What types of psychosis are there? Delusions are thoughts or beliefs that a young person might have but that are not shared or understood by others and tend to lead to problems for the young person and others. For example, the young person might believe that he is being spied on, or that there might be messages coming out of car number plates, or that the young person might have special powers. Some delusional beliefs can be very frightening. A young person might believe that something or someone is trying to kill them. These ideas are sometimes called paranoid delusions. Hallucinations A young person might experience hallucinations when they hear, see, taste or smell things that others do not. Most commonly, voices might start talking to the young person or amongst themselves about the young person in a negative way. 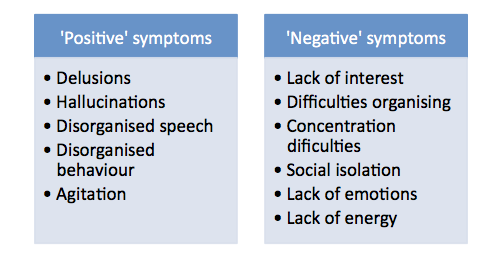 ‘negative symptoms’: Called negative because they make it more difficult for the young person to do everyday things or that experiences have been ‘taken away’ from the young person. Everything becomes an effort. The young person finds it more difficult to organise things, to look after him or herself, to think, to talk, to socialise. The young person stops doing the things he enjoyed doing in the past like interests or hobbies. An internationally recognised classification system is used in psychiatry to differentiate the various types of psychosis. An acute psychosis lasts only a few days. A schizophreniform psychosis lasts several weeks. Schizophrenia is diagnosed when psychosis persists for several months. Schizoaffective psychosis is a combination of psychosis and major mood swings. Most people would be at risk of experiencing some kind of psychotic symptoms if they were forced to stay awake for several days for example, or if they became physically unwell (also known as delirium). Other young people could experience short bouts of psychosis (days) that would end by themselves and do not necessarily happen again. Other young people might experience psychotic symptoms as part of a mental illness that will need the young person to learn to live with the illness for the rest of their lives, such as learning what things can make psychosis better and worse or taking medication or accepting help from others from time to time, including in rare occasions coming into hospital. Psychosis is a serious condition and needs to be assessed and treated as required. If it continues and is untreated it can limit a young person’s functioning in the longer term and may pose risks to themselves and others if delusions are acted upon in an unsafe way. How does psychosis normally start? Psychosis might appear suddenly, making the young person really frightened or it can also creep in so gradually that only close relatives or friends notice that the young person has been behaving strangely. The first episode of psychosis is normally not expected. The first signs are so vague that it would be difficult to think of psychosis. It is normally looking back in time that things not being right become clearer. The first symptoms of psychosis are called a ‘prodrome’. During the first time a young person experience psychosis, the prodromal symptoms might be so vague that neither the young person nor their family seek medical help. In later episodes, it is important to know that this is the time to do just that. Seek medical help as help and treatment at this time can stop an acute ‘flare-up’ of psychosis. At times, help is not sought at all at this stage and symptoms are let to get worse, in time, becoming so severe and unmanageable that they can no longer be treated at home resulting in hospitalisation. Everyone is unique and the symptoms of psychosis are influenced by the personality of the young person. Making a diagnosis is like trying to solve a difficult puzzle. The pieces of the puzzle are the combinations of symptoms, personality, age, history, triggers, duration of symptoms, etc. The diagnosis describes the type of psychosis a young person might be suffering from. This way, a treatment plan is worked out. The diagnosis can be made in a community service without the need to be admitted to hospital. However on occasions, the diagnosis is made after admission to hospital. Hospitalisation is at times needed because the symptoms are so serious that constant care is needed. Admission to hospital can have some advantages such as for example, an accurate diagnosis, treatment more easily started and monitored, young person and family being involved in setting up the treatment plan. It can take a long time for people with psychosis to seek help and start treatment. There are a number of reasons for this. The start of psychosis can be gradual and the symptoms and complaints vague. Some of the symptoms are things that we can all experience at some point (feeling confused, irritable, anxious). At first young people tend to minimise these problems, ignore them or try to cope with them by themselves. Family or carers also feel that what they noticed might just get better by itself. A symptom of psychosis is that the person experiencing it is not able to judge how psychosis is changing them, including their personality and this is an obstacle to do something about it. Another reason as to why it takes at times far too long for young people with psychosis to access help is that there are a lot of prejudices about psychiatry and mental illness. Young people are frightened of being called ‘mad’ or ‘crazy’. Psychiatric conditions such as manic-depression, severe depression, personality disorders, severe post-traumatic stress disorder can all present with psychotic symptoms. Psychosis can also be caused by prescribed drugs or street drugs as well as physical illness such as delirium, infections, metabolic disorders, vitamin deficiencies, epilepsy, etc. Neurodevelopmental disorders can also look like psychosis eg the thinking aloud, imaginary friends and role playing seen in Intellectual Disabilities or the sometimes unusual or strongly held beliefs in Autism Spectrum Disorders. It is important to rule out any possible medical cause of psychosis as the treatment and outcome are likely to be very different. A ‘split personality’. When suffering from a psychotic episode, there could be something like a split between the person and the outside -or the real- world, but there is no split within the person or personality. The term ‘multiple personality disorder’ has nothing to do with psychosis. The children of someone with psychosis will be ‘abnormal’. Although there is some risk of psychosis ‘running in families’ or ‘heritability’, the children of people who have suffered from psychosis, would have more chances of not suffering from it (rather than the opposite) and only a slightly higher chance of suffering from psychosis compared to the general population. Children with two parents who suffered psychosis would have a 39% chance of experiencing psychosis in their lifetime. Children with one parent with psychosis would have a 7% chance of developing psychosis. The risk for anyone else is of 1%. Psychotics are ‘dangerous’… The risk of people suffering from psychosis being a danger to others is minimal, and not significantly higher than the general population. People with psychosis are more likely to withdraw into themselves. The idea of people with psychosis being dangerous is more a product of the media and the cinema rather than being based in reality. It might be based on the fact that people with psychosis can act or behave oddly in a way that others might find difficult to understand and therefore find frightening. Psychosis is the result of ‘bad parenting’. This is not the case. Although parents and immediate family would be a very important part of any recovery plan by offering support and help, psychosis happens regardless of the type of upbringing one experienced. There is growing evidence of the effects of psychological trauma during childhood, as a risk to develop psychosis later in life. ‘Pills make you ill’. There is a lot of evidence to state clearly that medication is much more likely to make you better and also to keep you well. Medication and therapy are the main tools in the recovery from psychosis. The number of different antipsychotic medications available nowadays should ensure a good choice of medication with clear benefits in reducing symptoms whilst keeping side effects at bay. ‘You will never be able to drive again’… Again, this is not the case. Any one suffering from an acute episode of psychosis should not be driving and has an obligation to inform the DVLA. It is also important to do so in relation to medication and side effects. Most people, once the acute episode of illness is over, will be able to drive again even whilst taking medication, provided they are free from side effects that might affect their driving ability. Once you become psychotic, ‘you will never get better again’. This is another myth. 9 out of 10 people who suffered from a psychotic illness will recover, provided they receive appropriate treatment. The main risk for this people is actually, stopping medication. Between 70 and 80 percent of patients fall ill again in the first two years after recovery for this reason. Physical illness or injury: Head injury, high fever or poisoning eg mercury or lead can lead to hearing or seeing things. Drugs: Hearing or seeing unusual things that others cannot is at times a result of using street or prescribed drugs or at times of coming off medication. Hunger: When severe and as a result of having low blood sugar. Bereavement: When recent, the person can hear the deceased talking or have a feeling that they are present. Family inheritance: When a close relative has suffered from psychosis. For many young people, with the right treatment, it is possible to manage the symptoms of psychosis and recover. At times, some psychotic symptoms will not go away completely during or after treatment. There are ways to help young people learn how to cope with these experiences so they become less distressing and do not interfere with life. In the treatment of psychosis there is no easy route to recovery. None of the treatments available work every time but there are many more chances of making a full recovery if a number of treatments or interventions are followed. There are different treatment options for young people who suffer from psychosis. A mental health professional, would be able to discuss all options available and help choose the right treatment plan for the young person. An advocate might help accessing the treatment that might be needed at the time. The main treatments available to treat psychosis at present are medication, Cognitive Behavioural Therapy (CBT) -talking therapies- and Family Therapy. 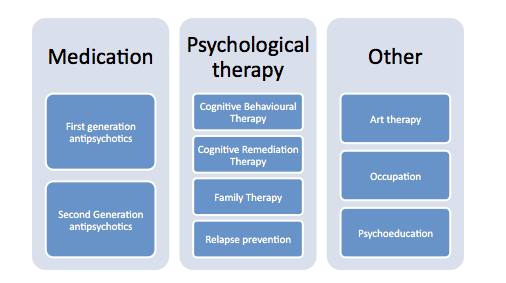 There are other interventions that could be of help in addition to the above including, psychoeducation, relapse prevention, adherence therapy, art therapy, smoke cessation, early intervention teams, crisis services, occupational therapy, exercise, relaxation, admission to day or inpatient hospitals, cognitive remedial therapy, etc. Medication: Is one of the cornerstones of treatment. Tablets or injections help bringing symptoms under control. They reduce delusions and hallucinations and help young people become aware again of what is real and what is not around them. They help young people regain control of themselves and their lives again. Most young people experiencing psychosis will be offered drugs (anti-psychotic medication). There might be other drugs offered as well to treat depression (antidepressants) or mood stabilisers if the young person experiences major mood swings or drugs to reduce possible side effects from medication such as stiffness or tremor (anticholinergics). All drugs have side-effects and antipsychotics are not an exception to this. The ‘older’ antipsychotics or also called ‘first generation’ cause what are called ‘extrapyramidal side-effects’ such as stiff muscles, tremor, cramps or restlessness. Newer antipsychotic drugs or ‘second generation antipsychotics’ have far fewer of these side effects. However, they may cause other side effects eg weight gain. Talking therapies: They help young people understand their experiences and develop coping strategies to cope with them. Cognitive Behavioural Therapy for psychosis (CBTp), focusses on reducing the distress caused by positive symptoms by challenging them, checking the correctness of how the young people interprets them. Family therapy helps people with psychosis stay well. The young person is encouraged to talk to their family and explain what sort of support is helpful – and what makes things worse for them. Family therapy improves relationships in the home of the young person affected by psychosis. Relapse prevention Helps by controlling triggers for psychosis, recognizing early warning signs of psychosis and having a good relapse prevention plan in place. Cognitive Remediation Therapy: Helps with some of the abilities that can be lost after a severe episode of psychosis. Getting stressed about things in life, using street drugs or drinking alcohol make psychosis worse. Not looking after oneself and not sleeping enough at night. Getting anxious about exams, friends, relationships, but not asking for help or advice from others. Disagreements with family or neighbours can make psychosis more likely to happen if susceptible, or make it worse if psychosis is already occurring. What is the normal course of psychosis? It is difficult to know what the long term effects of suffering from psychosis might be. 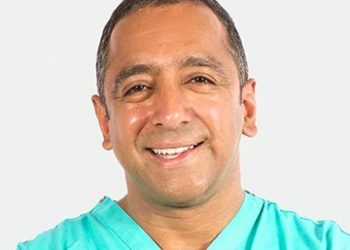 In many occasions, a definite diagnosis cannot be given straight away. Most young people diagnosed will recover from their psychotic episode when they receive early help and treatment including medication and therapy. The majority will have a permanent recovery. Unfortunately, treatment is often started late, in these young people, their recovery is not as good. It is important that a psychotic episode is detected as soon as possible. The so called ‘early warning signs’ are similar –although watered down- versions of the typical previous psychotic symptoms. They can include loss of energy, lack of motivation, depression, anxiety, sleep problems, attention and concentration difficulties, isolation from others and strange thoughts. It is important to do something about signs like these as soon as possible, particularly if they look like the signs that the young person might have experienced previously. It is a very real possibility that symptoms like these will not go away with time and that they will get worse as no help or treatment is sought, making long term consequences worse. The more episodes a young person experiences, the more likely it is for them to become more severe and a full recovery is less likely to happen. With medication, rest and therapy, things generally improve. In many, the recovery is permanent. For young people who suffer from a prolonged episode of psychosis, one in three improves provided that appropriate treatment is kept. Between 10 and 15 percent of these achieve a full recovery and are free from psychosis 10 years after first diagnosis. Also one in three young people that suffer from a prolonged episode, the illness will be long term with typical ups and downs with improvements followed by symptoms coming back again. For these young people, stopping medication even when they are feeling fully recovered, often leads to a relapse. Seven out of ten will fall ill again if they stop medication. There are people who do not recover or respond well to treatment. The more relapses they have and the longer the episodes of psychosis last, the worse their condition becomes. These young people need long term and sustained care and treatment. Some young people are at risk of becoming depressed as a result of experiencing psychosis that is difficult to treat. They can become hopeless and consider suicide. Although this is rare, it is important to be aware of it, particularly as a relative or a carer. Does psychosis run in families? Psychosis is a condition that can be passed down through genes. Families that already have a member with psychosis, related family members and generations to follow can inherit the condition. This is called genetic predisposition. As mentioned before, children of people who have suffered from psychosis would have more chances of not suffering from it (rather than the opposite) and only a slightly higher chance of suffering from psychosis compared to everyone else. Generally, the earlier help is sought by the young person or their family, a higher chance of the right treatment being given. Help can be sought from your immediate family, close friends, school nurses, gps, child and adolescent mental health services etc. Peer support: It works by bringing together people who have had similar experiences to support each other. Recognise your own triggers: It could be helpful keeping a diary recording mood, diet, sleep, life events, etc. This can help understanding what triggers psychosis, what makes it worse, think about what has helped in the past, recognise warning signs that tell when the young person is becoming unwell. Learn to relax: Learning some relaxation techniques can help when feeling busy, anxious or stressed. Self-care: Having a good sleep gives energy to cope with difficult feelings and experiences. Having a good and regular diet helps with mood and energy. Taking some exercise is helpful for mental wellbeing and being occupied and active (gardening, cooking, making things) helps to feel connected and valuable. Create a crisis plan: Especially when you are well as right in the middle of a crisis is not the best time to do this. Avoiding the use of street or illicit substances: As it is clear that these can make psychotic symptoms more severe and intense. Listen and try to understand: It is important for young people experiencing psychosis to feel they can talk to someone they can trust. They need to feel they can do this in a calm and supportive manner. Focus on feelings rather than experiences: It’s better to help by discussing how the young person might feel about the experiences he is having rather than to engage on discussions about whether the experiences are real or not. Respect their wishes: Young people with psychosis do less well when family are critical or overprotective with them. It is important to respect the young person’s wishes as much as possible. Family therapy: Helps to understand what the young person in going through and what might and might not help them. Plan for a crisis: When the young person is feeling well, this is the right time to plan for a possible future crisis. Discuss treatment and hospital visits and agree the things you will be able to support them with and the things you will not. Should I tell others about my psychosis? This is a difficult decision. It comes up when starting a new relationship, making new friends or going for a job interview. Many young people, who experienced a psychotic episode, try to hide their previous problems for fear of being rejected. It is unfortunately true that psychosis is poorly understood by many people and some can feel frightened or wary. This fear comes up as a negative or distant attitude. This is also called ‘stigma’. It is a good idea to learn more about these negative attitudes and be able to protect oneself against them. Frankness and honesty are important, but feeling self-confident and being able to deal with rejection are also very important. Sometimes there may be legal requirements to disclose a diagnosis or psychiatric history eg for certain jobs or to drive a vehicle. John Nash (1928-2015), American mathematician. William Chester Minor (1834-1920), American surgeon. David Helfgott (1948), Australian pianist. Vaslav Nijinsky (1890-1950), Russian ballet dancer. Antonin Artaud (1896-1948), French dramatist. Lionel Aldridge (1941-1998), American football player. Charles “Buddy” Bolden (1877-1931), American musician. Eduard Einstein (1910-1965), Son of Albert Einstein, Swiss medical student. Zelda Fitzgerald (1900-1948), American socialite. Jack Kerouac (1922-1969), American poet. Veronica Lake (1922-1973), American actress. Rufus May (1968), British psychologist. Vincent van Gogh (1853-1890), Dutch painter.